In a ductless mini-split air conditioning system, an air handler (shown) is wall or ceiling-mounted in one or more rooms. Many can heat air as well as cool it. Here's a problem: You'd like to install a central air conditioning system in your house, but there is no existing forced-air ductwork system to distribute the cooled air. While it is possible to retrofit a ductwork system, this work can be expensive and disruptive to the home and floor plan, especially in a multi-story house. Dr. Energy Saver has a better solution. Ductless air conditioners can provide the same comfort and energy savings as central AC, and is a much more realistic process than trying to install an entire ductwork system. Contact your local Dr. Energy Saver to see how ductless AC would operate in your home! Ductless air conditioning systems, also know as mini-split systems, come with a compressor and condenser outside the home and a small air handler unit mounted on the wall or ceiling inside. The two parts are connected by refrigerant lines, and one air handler is designed to cool one room. Mini-split systems offer very good efficiency and are much more cost efficient than installing the ductwork required for central air. Mini-split AC systems are rated according to BTU output. Smaller mini-split units power only one or two air handlers, while larger mini-split systems can include four or more. If you invest in an ENERGY STAR mini-split AC system, you can expect high levels of energy efficiency as well as trouble-free performance. Our experts will help you choose the right system for your air conditioning needs. If you're interested in installing a mini-split ductless air conditioning system in your, Dr. Energy Saver can help. Our experts will evaluate your home and help you determine the best air conditioning systemfor your needs. 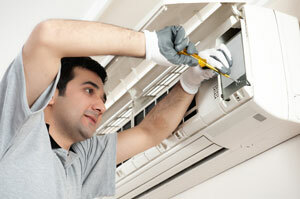 We also provide complete repair and maintenance services for mini-split AC systems. Contact your local dealer today to get an estimate on the services you need!